Fever is a “roll your own” RSS solution that you host on your own server, with some unique productivity twists. Once you install it on your server, you access your feeds in a web browser. I’ve also found one app, Reeder for iPhone (but not Reeder for iPad or Mac) that supports Fever. In addition, Fever works well as a standalone “app” that you set up using Fluid. (Fluid is a Mac app that lets you turn web apps into standalone apps). One other important fact about Fever – it isn’t free, like some of the other Google Reader alternatives. Fever will set you back a one time cost of $30. 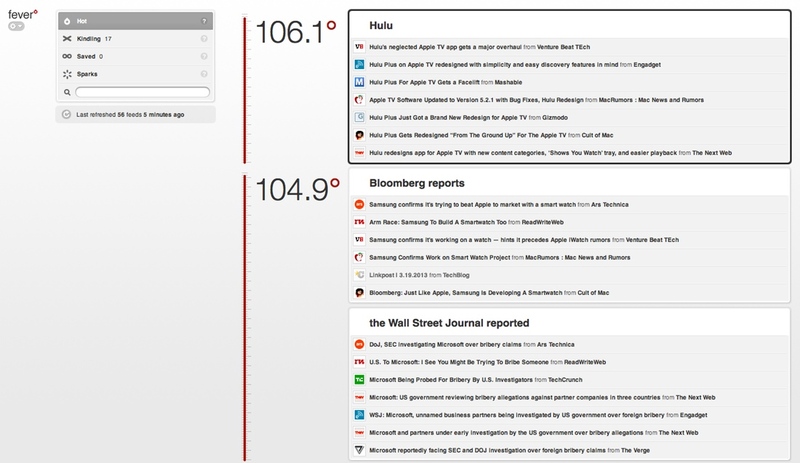 Fever is unlike any RSS tool that you’ve seen. The idea behind Fever is that many of us can’t keep up with the feeds that we follow, and need help staying on top of them. Fever’s solution? Having you subscribe to more feeds, of course. Fever creates a “Hot” list, where popular topics rise higher on that list depending on how frequently those topics are mentioned in your feeds. The more feeds you add, the better your Hot list will be. You can filter your Hot list to view a particular slice of time, such as a two day window of time starting four days ago, or just Hot items from today. You might think that adding more feeds will just clutter your feed list. That’s where the distinction between “Kindling” and “Sparks” comes in. In your Sparks section of Fever, you put high volume or high noise feeds that you don’t necessarily want to follow directly. Those Sparks will then help generate the content in your Hot list, which will show you content that is being heavily covered in your feeds. Kindling, by contrast, is made up of your “must read” feeds, and you can use this much how you use a traditional RSS reader, like Google Reader. Within your Kindling, you can create different groups, just like you can in Google Reader. I like Fever, but not because of the Hot list. I find that most of the items in the Hot list are news items that were already popping up in my Twitter stream. I use RSS more as a way to follow how-to sites, and sites with info that might be a bit more off the beaten path. I like Fever because I control it, and because my favorite RSS app supports it – sort of. I use Reeder on the iPhone, iPad, and Mac, and only the iPhone version supports Fever. I’m hoping that the other two versions will support Fever in the future. Although the Reeder iPhone app can display your Hot list, you can also just use the app to view your feeds the same way you used it with Google Reader. With the Reeder iPhone app, syncing is not as fast as Google Reader syncing, but it is pretty quick if you configure Fever and the app a certain way. I’ve set up Fever on my server to automatically update my feeds every 15 minutes. This requires a basic understanding of how to set up a cron job, although the app’s documentation tells you the exact command that you need to use. Then, in Reeder for the iPhone, I have the app download the feeds, but not trigger an update on the server first. Fever won’t be for everyone. You do need to set it up on your own server. I have a couple of hosting accounts already, so it wasn’t an extra expense for me, aside from the purchase of the app. You also need to know how to set up a database on your server, and copy files to your server. That is all that is invovled in the installation, so if you’ve previously installed a CMS like WordPress or Joomla, you can install Fever. I still have Newsblur to try out, but right now it looks like Fever stands a good chance of being my new RSS app. 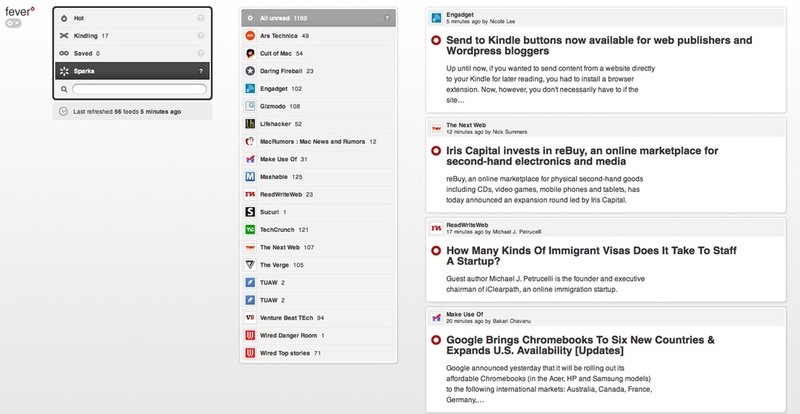 I did try Feedly, which has gotten some good press over the past few days. Frankly, I don’t quite understand the love for it. It has a beautiful interface, but the mobile apps aren’t efficient at all if you follow many feeds. It really seems like a case of form over function. Fever, on the other hand, shows promise. If Reeder ends up supporting Fever on the iPad and Mac, then Fever will get my vote. I might be checking Fever too after your recommendation. The other thing that is going to annoy me about Google is when they take away iGoogle. I love using it to keep a list of my favorite blogs as well as my frequently used bookmarks. Do you know of another service that could replace this on my homepage? This looks like a pretty nice tool. I have never heard of it before. Do you have an update of whether or not iPad’s will support it? I haven’t heard, no. However, Reeder on the iPad is now free, because it hasn’t been updated lately. It wouldn’t surprise me if it is included when updates come, and the developer starts charging again. The interface isn’t too bad on the iPad using Safari. It looks cool though i have heard about it before and it is a valuable addition. Maybe a weird comment… but would anyone be interested in buying my Fever license off of me? Unfortunately it wasn’t really for me.